The Orpheum Theatre San Francisco was built in 1926 and is located at 1192 Market at Hyde Street. The Orpheum Theatre recently underwent a $20 million renovation in order to bring it up to standards for today's touring Broadway shows. 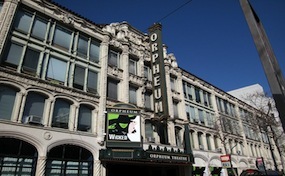 The Orpheum Theatre box office recently played host to Wicked the Musical for over a year and a half from January 27, 2009 to September 2010. Orpheum.TheaterSanFrancisco.com is not a primary vendor, supplier, or affiliated with any official website. We proudly provide access to a large supply and low prices online for all secondary market events. Ticket prices may be well below or above face value and will fluctuate with the market. To purchase tickets for all Orpheum Theatre San Francisco Events simply click on the show of interest or call our operators at anytime.